NOTE: This giveaway has been closed on Feb 5th, 2012. WAV To MP3 is a Windows application designed to convert WAV sound files to MP3 audio fast and easily. 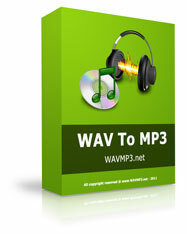 With WAV To MP3 users are able to convert recorded wav sound files to MP3 for iPod or MP3 Player. Besides WAV to MP3 conversion, WAV To MP3 also supports to convert WAV to FLAC format for audiophiles.